I saw my guild leader was in-game today, so I logged on to say hi because I hadn’t spoken with him in a while. He and some other guildies and alliance members have begun playing WoW lately, and he’s been losing interest with WAR. So, guess who’s now guild leader? I’ll have been with my guild for a year come July, but this is going to take some seriously getting used to. And a recommitment to guild recruitment. I’m also hoping that this won’t stress me out too much and cause me to ragequit. Things have been kind of rocky lately, and I’m our fourth leader in about two-three months. We need some stability, and I’m praying I won’t run us into the ground. Well, I suppose this means no more lurking on alts on different servers for a while. Anyone have any advice on running a guild? I thought the three Destro warbands we had roaming around the lakes the other night was a lot. I was mistaken. 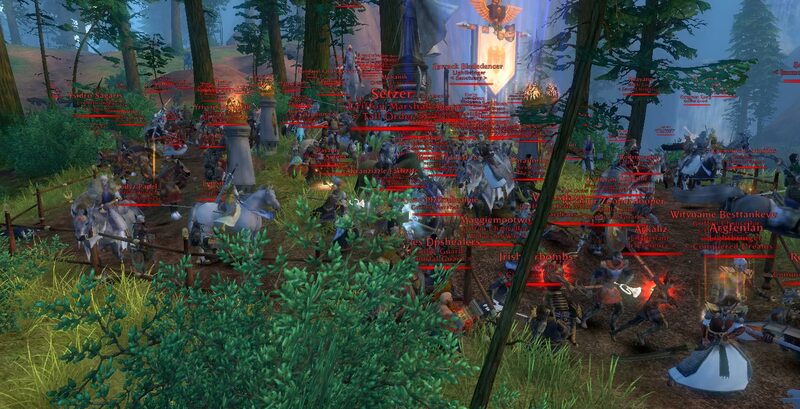 After we failed to reach a Stage 2 in Altdorf last night, we were confronted with an Order zerg in ORvR. 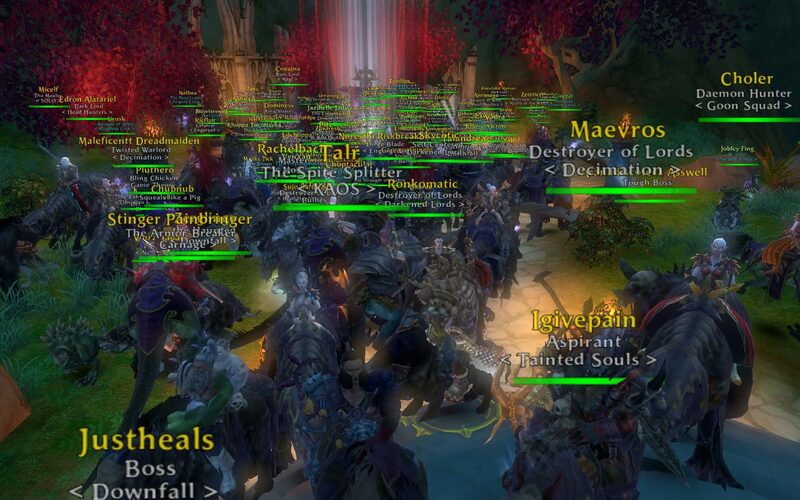 Nothing like getting trampled by anywhere between 150-180 red names to make running tombs sound pretty good. I couldn't fit them all in the screenshot. More and more just kept running over me! All it takes is mention of 100% bonus to renown and experience, and tons of people come out of the woodwork. Us Destruction folks usually have an overwhelming desire to smash in the skulls of those vertically-challenged dwarfs, sissy high elves and namby-pamby humans. 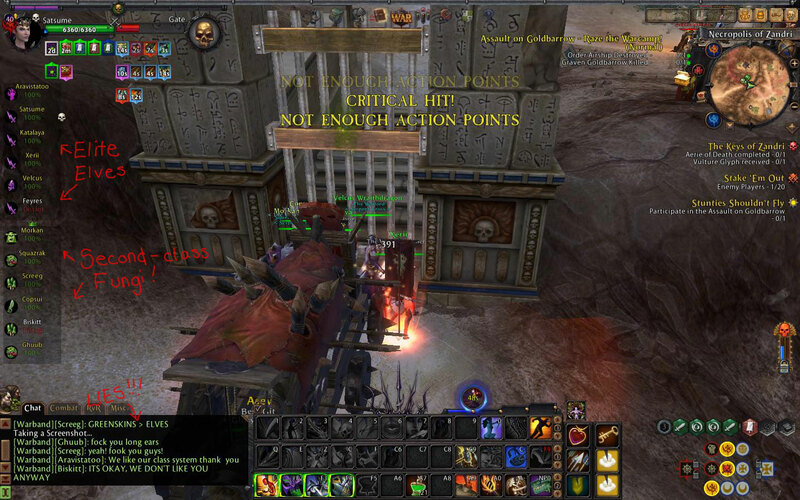 Sometimes though, such as during airship raids, we take the time to lovingly reinforce warband segregation. It simply wouldn’t do for our Witch Elf Assassination Squad in the VIP party to be contaminated by fungi.